We may have a full college football season to go in between now and more college hoops, but basketball fans are already getting excited about the year ahead. As you may have been able to tell in our recent post about the Maui Invitational, the schedules for top teams are starting to be released, and that just makes the games feel that much closer. But who exactly are those top teams heading into 2016-17? It's probably still a little early to say, but with recruiting for the coming season long since wrapped up, and the NBA Draft behind us, we now know how teams should look at the outset of the season. So based on the rosters and a few other factors, here are five teams you should be ready to keep an eye on when college basketball resumes in November. A perennial contender that uncharacteristically struggled in 2015-16, Duke should be back in the Final Four conversation if all goes well this coming season. The Blue Devils topped ESPN's latest way-too-early top 25, and with good reason. Not only do they have a top recruiting class coming in (led by forwards Harry Giles and Jayson Tatum and guard Frank Jackson), but they'll also have some extraordinarily capable veterans. Adding fifth-year senior Amile Jefferson (who was injured for much of last season), senior Matt Jones, and junior star Grayson Allen to a crop of elite freshmen will give Coach Mike Krzyzewski a unique blend of experience and youth. This is not your typical college basketball team these days, and it looks like the team to beat. Duke's Harry Giles has been considered the top freshman in the incoming class for the most part. However, he's dealt with multiple serious knee injuries, and if he drops off at all it may be Kansas commit Josh Jackson who headlines this class. A dynamic small forward currently projected as the top pick in the 2017 NBA Draft, Jackson (and fellow freshman Udoka Azubuike) will add some serious talent to a roster that already has a veteran backcourt in Frank Mason III and Devonte' Graham. That should be enough for Bill Self to do some serious damage, and if Jackson pans out they'll be right in the national title mix. As usual, John Calipari saw the bulk of his team depart for the NBA in June. But the class he has coming in actually ranks as the top class in the country, and though the team won't have the touches of experience and leadership that Duke and Kansas will benefit from, the raw talent is formidable. Guards Malik Monk and De'Aaron Fox will become household names among college basketball fans by December, and forwards Bam Adebayo and Wenyen Gabriel are excellent five-star prospects. This is a roster with which Calipari will hope to replicate the success of the 2011-2012 team that won behind Anthony Davis and Michael Kidd-Gilchrist. Let's not forget, Oregon was an elite eight team and a #1 seed in last year's NCAA Tournament. At the time, some analyses counted it as the biggest surprise of the tournament that Oregon got the top seed out West. But the Ducks defeated Duke in the Sweet 16 and advanced to the regional final. They did so largely behind guard Tyler Dorsey alongside forwards Dillon Brooks and Chris Boucher, and all three players will be back for more in 2016-17. The recruiting class for Dana Altman isn't on par with the others on this list, but incoming point guard Payton Pritchard should provide good depth in the backcourt. This team could well be a top seed once again. The Tar Heels won't be what they were in 2015-16 when they nearly pushed the National Championship game to overtime. But things look better than they once did. Big man Kennedy Meeks and small forward Justin Jackson both withdrew their names from the NBA Draft and will return to join guard Joel Berry II, who improved by leaps and bounds toward the end of this previous season. The recruiting class is good, not great, but one-time YouTube phenom Seventh Woods and five-star big man Tony Bradley should give the Heels a boost. None of this makes up for the loss of Brice Johnson and Marcus Paige, but if things go right for North Carolina they'll be back in the conversation. There will be plenty of other good teams in what looks to be a pretty fun season ahead. Villanova, Virginia, and Michigan State in particular may belong on the same tier as the five teams mentioned above. But if you're excited to follow the sport this coming year, these are the teams you'll be watching the most. He also vowed to protect gays and lesbians from violence and oppression, a pledge that was greeted with applause from the crowd. Clinton was on the verge of naming a running mate to join her in taking on Trump and his vice presidential pick, Indiana Gov. The prosecutor said a text message from the same man found on a phone seized at Bouhlel's said: "I'm not Charlie; I'm happy". Hours after the attack, prosecutors said one of the accomplices also filmed the bloody scene on the promenade. When it came time to nominate Trump, 15 delegates pledged to Cruz after the March primary still voted for the Texas senator. US Senator Ted Cruz of Texas has refused to back Donald Trump . "I think we all should get behind our nominee Donald J. 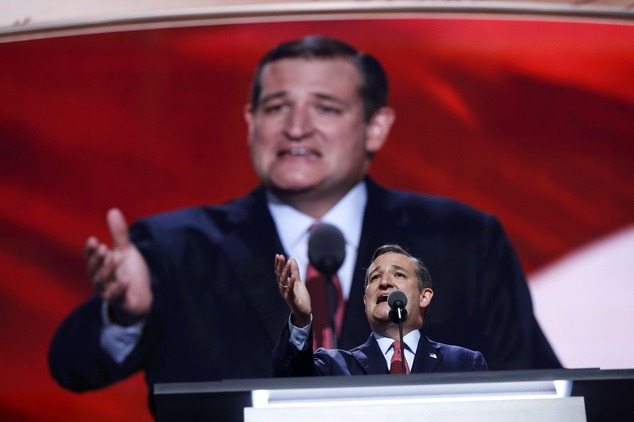 Watching Cruz give a speech is about as delightful as dysentery. " They were very mad about it", she said. Much is riding on Trump's speech, which will be broadcast nationwide to an audience of millions. According to the Epoch Times , Google verified with them that neither Pokemon Go , nor Niantic has received any other information. You'll then log into the app itself and attempt to capture whatever digital creature is lurking nearby. France's far-right National Front party is calling for restrictions on immigration in response to the Nice attack. Lahouaiej-Bouhlel was shot dead after he opened fire on police, a prosecutor said. Ted Cruz shocked the 2016 Republican National Convention Wednesday night when he refused to endorse Donald Trump for president. Former House Speaker Newt Gingrich veered from his Teleprompter cues to insist Cruz had in fact - indirectly - endorsed Trump. On Friday night in Cleveland, Donald Trump will officially accept the Republican nomination for President of the United States . A statement was issued through the campaign by a speechwriter, Meredith McIver , whose resignation offer was rejected. First Lady Michelle Obama is never a "dulling" woman as she continues to entertain us with this latest feat. In fact, she said she's only been able to do it once, when her daughter Malia was learning how to drive. You then "capture" the creature for points by throwing Poké Balls at it on the device's screen", Trend Micro stated. Based on the 1990s Japanese franchise, the augmented reality game topped Apple Inc's free app charts.